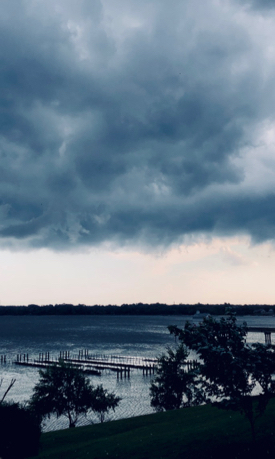 The rain that has plagued the U.S. East Coast for the last few weeks has caused serious flooding throughout the Chesapeake Bay watershed and carried huge amounts of debris into the Bay’s upper reaches. Runoff from the rain has also noticeably lowered Bay salinity, with impacts to both the Bay ecosystem and marine research. Just how wet has it been? Since July 21st, 6 to 10 inches of rain has fallen across most of Virginia, with 10-15 inches across much of Maryland and Pennsylvania—and this follows a very wet May in the mid-Atlantic. All this rain has saturated watershed soils—thus promoting surface runoff rather than groundwater recharge—and pushed the freshwater plumes of Bay tributaries further toward the mainstem. The result? 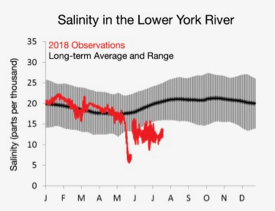 Whereas mid-summer salinity near the mouth of the York River and other lower Bay tributaries typically hovers around 20 parts per thousand, recent measurements show values as low as 10 ppt—only half as salty. Full seawater averages around 35 ppt. Researchers at the Virginia Institute of Marine Science have observed both positive and negative effects from the reduced salinity and storminess, with impacts on everything from algal blooms to fish distributions, oyster mortality and disease prevalence, the conduct of in-lab experiments, and the incidence of low-oxygen dead zones. One of the most significant impacts of the reduced salinity is the near absence of the potentially harmful algal species that typically begin to bloom at this time of year in lower Bay waters. Their scarcity has affected research by a number of VIMS scientists, including professors Iris Anderson, Mark Brush, and Kim Reece. Reece says “There’s no sign yet of our typical late summer blooms of Margalefidinium polykrikoides or Alexandrium monilatum. 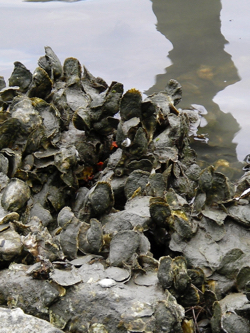 This is good news for local shellfish growers, but not great for our field experiments, in which we’re aiming to study the impacts of these bloom species on oysters.” The experiments—funded by ECOHAB and Aquaculture grants from NOAA and a Virginia Sea Grant Fellowship to graduate student Clara Robison—were timed to coincide with the regular appearance of M. polykrikoides in the lower Bay in late July and of A. monilatum in August. Brush, a collaborator on both the ECOHAB and NSF grants, says the absence of the blooms is most likely due to “a combination of the low salinity, low light during the rainy days, and increased flushing of the York River.” The reduced salinity and light hinder algal growth, while increased flushing removes the algae faster than they can reproduce. The rain-induced drop in Bay salinity has also affected fishes, as clearly observed in early results from the Juvenile Striped Bass Seine Survey at VIMS. “Fish sampling on the seine survey has certainly been impacted by the low salinities this summer,” says survey manager Brian Gallagher. “Though overall abundance doesn’t appear to be affected, juvenile striped bass are spread out over a much wider area than usual. They are typically concentrated in mid-river locations, but we have seen unusually high numbers at downriver stations, 10-20 miles from the mouth of each river.” Gallagher attributes the shift to a downstream incursion of the fresher waters the juvenile stripers prefer. Low-oxygen “dead zones”—or the lack thereof—provide another case where storminess rather than low salinity may have played the major role in recent events.